BBQ Pulled Pork – How to cook a pork shoulder! How to make pulled pork at home, on the cheap (without buying hellishly overprices tiny packets of the stuff) and what to do with it when you’ve got it! I moved out of my family home in the summer and since then I have been living with my fiancé in our student flat. I tell you this because then it shouldn’t then come as a surprise that I have never roasted anything before let alone a joint of meat like this – heck I’m not even sure I’ve cooked anything quite this big before… But my love of pulled pork prevailed, I persevered and good results were had! So what is it exactly? That piece of raw meat (that I got all weird about and insisting on not touching with my bare hands) on a foil-lined baking tray, is a piece of meat known at the pork shoulder. It can be found in most supermarkets and is fairly cheap. This cost me £5.50 and was about 2kg. I’ll get on to what we did with it later but with the two of us it lasted 4 dinners and 1 lunch so it worked out very budget friendly! It wasn’t even too difficult to do but did take around 6 hours and a bit of sorting out at the end. Its obviously quite big so needs plenty of cooking time. We left it for 6 hours on 160 degrees C and this was perfect when it came out – it was probably done about an hour before that but I didn’t want to risk it being under-done! We then took it out of the oven, turned the oven up to 250 degrees C and then once it was hot we put the pork back in for a quick blast – this is optional obviously but we ended up with a couple of pieces of crackling from the edges of the fat where it had gone crispy. I’ve heard this doesn’t always work so I was quite pleased we actually got some! Once it’s all cooked you can pull/carve the fat off the top. Take two forks and start shredding the meat. We had a little production line going in the kitchen, I was in charge of separating the meat from the fat and passing it on to Josh, then Josh would shred the meat and pop it into the container. Obviously if you’re a one-man-band it’ll take a little longer but I don’t think it was too difficult 🙂 We then added a jar of Asda’s BBQ and Maple sauce (75p!! )- obviously I would’ve liked to make my own but I couldn’t do that this time – this was really nice though and had more of a tomato taste with a hint of sweetness from the maple. So here is out final product! 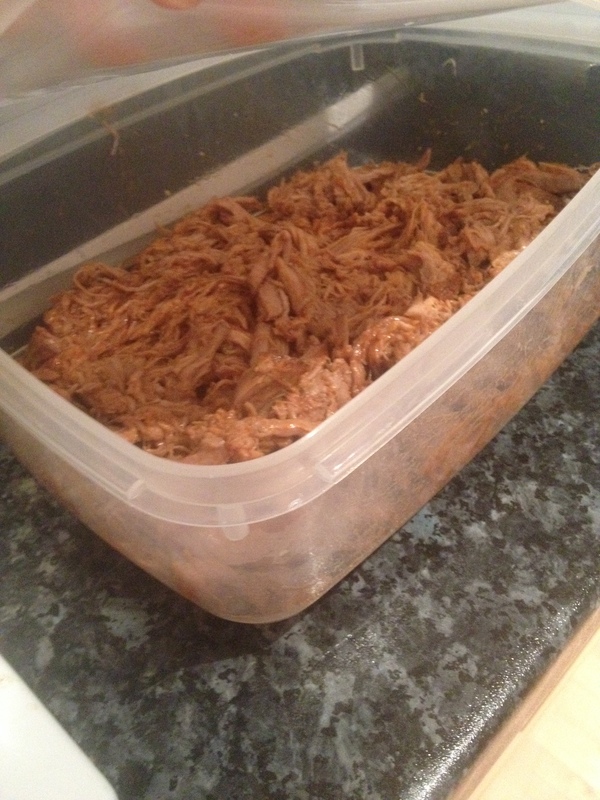 A large container of pulled pork ready to go! There was actually so much of it that I had to get a bit imaginative with what I did with it! 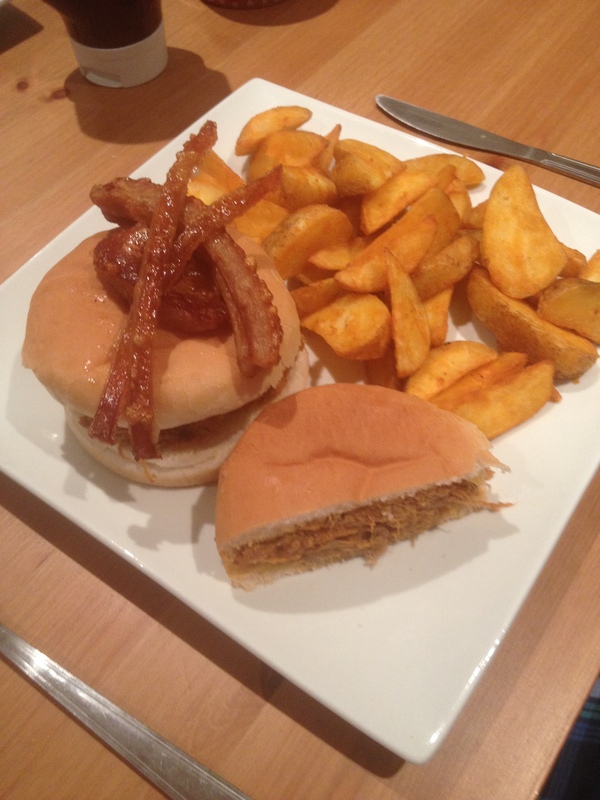 On the first night we had pure and simple pulled pork rolls with wedges and some salad which was really good. Then after that it was working out what to do with it all! Day 2 we had pulled pork wraps for lunch and then made our own pizza for dinner – it was super simple. 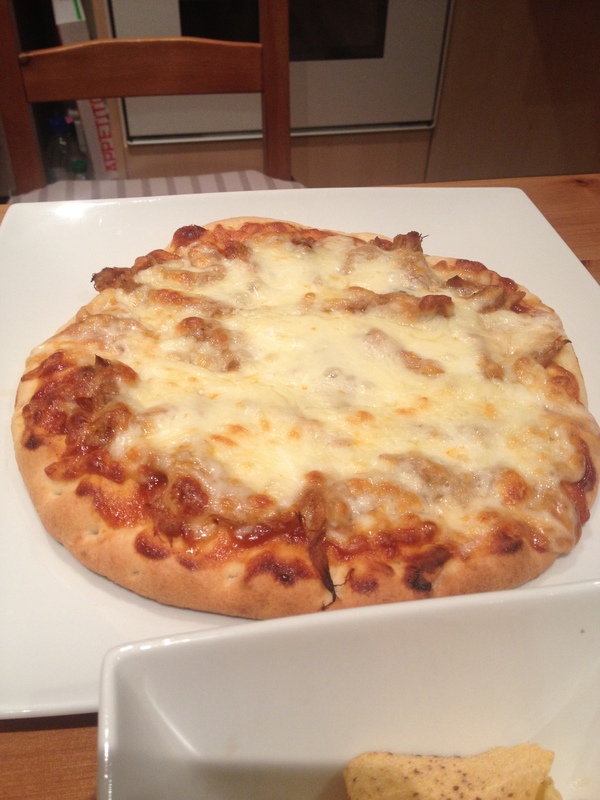 We bought 2 plain pizza bases, added some bbq sauce, pulled pork and fresh mozzarella. Day 3 we used the pulled pork as a topping for jacket potatoes. I did the jacket potatoes in the slow cooker (just wrapped them in foil and left them for 4 hours) while I was out at uni and this was all ready for when I got home! Then Day 4 I used the rest of it to make pulled pork quessadillas. I heated up a frying pan (no oil or butter) and added a tortilla wrap, the pulled pork on top with a handful of grated mozzarella cheese, then a second tortilla wrap on top. Once the bottom had started to go crispy and light brown I turned the whole thing over and waiting for the other side to do the same. The cheese should then be all melty inside, we sliced them up and had them with nacho’s and soured cream! I thought all these meals were great and were different enough that we didn’t get bored! Not that I thought we would.. Who gets bored of pulled pork? Either way it was a great way to save money this week – we didn’t spend nearly as much on our weekly shop as we usually do 🙂 So what did I learn? Don’t be intimidated by large food and don’t be too scared to give something a go!